I love having tea parties. I am obsessed with gourmet teas, Victorian teaware, and yummy desserts (gluten-free, of course). I love getting a few of my best girlfriends together for afternoon tea at my house to talk, drink, and eat… It’s the best! 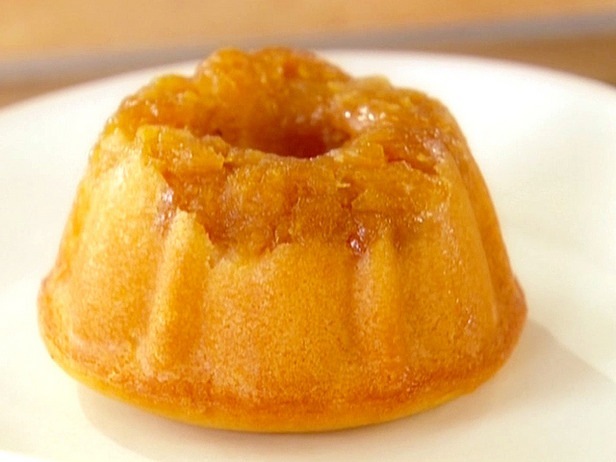 I found a fabulous recipe for Pineapple Mini Cakes by Giada De Laurentiis and I have translated below to be gluten-free. It would make an excellent & adorable dessert to serve alongside your favorite tea the next time you want to invite your best friends over for tea time. Enjoy! Place an oven rack in the lower 1/3 of the oven. Preheat the oven to 325 degrees F. Butter and flour a mini Bundt pan (use all-purpose gluten-free flour to dust your pan). For the Cakes: Place the pineapple in the bowl of a food processor. Pulse until coarsely chopped. In a 10-inch nonstick skillet, combine the chopped pineapple, 2 tablespoons pineapple juice, sugar, and butter over medium-high heat. Bring the mixture to a boil, stirring occasionally. Cook until the liquid evaporates and the mixture begins to brown, about 10 to 15 minutes. Spoon the pineapple mixture into the prepared pan. In a large mixing bowl, combine the egg whites, water, vegetable oil, almond extract, GF cake mix, and 2/3 cup pineapple juice. Using an electric hand mixer, beat the mixture on medium speed for 2 minutes. Pour the batter over the cooked pineapple. Bake for 28 to 30 minutes until the cakes begin to pull away from the sides of the pan and the tops are golden. Allow the cakes to cool for 15 minutes. Place a piece of parchment paper on top of the cakes. Put a baking sheet, upside-down, on top of the parchment paper. Flip both pans over and allow the cakes to cool completely while still in the Bundt pan, about 1 hour. Unmold the cakes and place on individual serving plates. Cook’s Note: This recipe will also work using 1 (20-ounce) can crushed pineapple in 100 percent pineapple juice, drained and juice reserved. Try this yummy gluten-free recipe from Eating Well.com the next time you are in the mood for pork! *Use organic ingredients whenever possible for a yummier, better-for-you version of this dish! Place 1/4 cup salt and brown sugar in a medium heatproof bowl. Pour in boiling water and stir to dissolve. Add ice cubes and stir to cool. Add pork chops, cover and refrigerate for at least 30 minutes or up to 4 hours. Puree peaches, tomato and vinegar in a food processor until smooth. About 30 minutes before you’re ready to cook the pork chops, heat oil in a medium saucepan over medium-high heat. Add onion and cook, stirring occasionally, until golden brown, 5 to 7 minutes. Add ginger and cook, stirring frequently, until fragrant, 1 to 2 minutes. Add the peach puree, the remaining 1/2 teaspoon salt, honey and pepper to taste. Bring to a boil over high heat, then reduce the heat to a simmer. Cook until reduced by about half, 20 to 25 minutes. 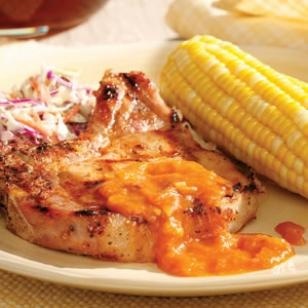 Reserve 1/4 cup of the sauce for basting the chops; keep the remaining sauce warm in the saucepan until ready to serve. Remove the pork chops from the brine (discard brine), rinse well, and thoroughly dry with paper towels. Season the chops with 1/4 teaspoon pepper and brush both sides with some of the reserved sauce. Grill the pork chops, turning once, until an instant-read thermometer inserted into the center registers 145°F, 2 to 4 minutes per side. Transfer to a plate, tent with foil and let rest for 5 minutes. Serve with the warm peach barbecue sauce on the side. Make Ahead Tip: Brine the pork chops (Step 1) for up to 4 hours. 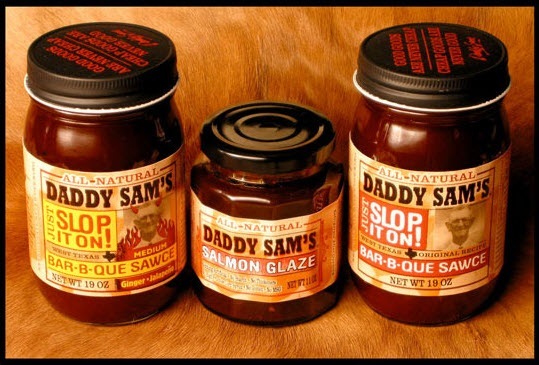 Refrigerate the peach barbecue sauce (Step 3) for up to 5 days. I often like to make rice as my starch for dinner. Since regular (gluteness) bread is out of the question, rice serves as a good replacement. It’s inexpensive, filling, and a good side choice to pretty much any meat dish. But I’ll admit it, rice is kind of boring. That’s why I was super excited to find this super tasty rice dish that turns an ordinary side into a full-on fabulous gluten-free main meal. Try it tonight! In a medium nonstick saucepan, heat 1/2 of the butter over medium-low heat. Add the rice and cook, stirring frequently, until golden, about 6 to 7 minutes. Add the chicken stock and salt. Bring the mixture to a boil. Reduce the heat to medium-low and simmer covered for 20 to 25 minutes until the rice is tender and all the liquid is absorbed. Remove the pan from the heat and rest covered for 5 minutes. In a large skillet, melt the remaining butter over medium heat. Add the garlic and cook, stirring frequently, for 1 to 2 minutes until aromatic. Add the shrimp, lemon juice, and hot sauce. Cook for 2 to 3 minutes until the shrimp is pink and cooked through. Stir in the cream and heat through. Season with salt and pepper, to taste. Using a fork, fluff the rice and arrange on a platter. 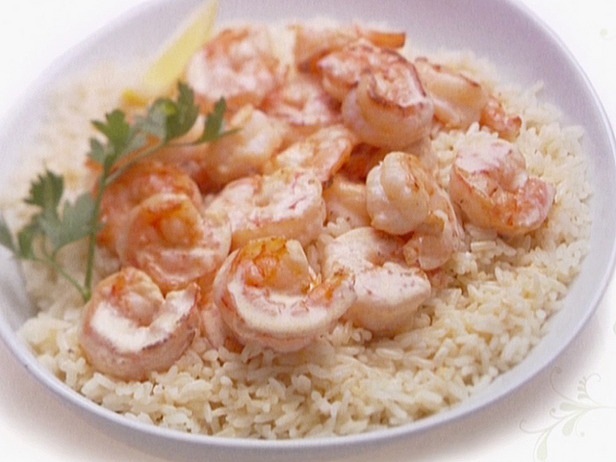 Spoon the shrimp cream sauce over the rice and serve. I woke up this morning with a huge craving for chocolate. Yes, I always like & am in the mood for chocolate, but this morning was different. I would not be OK unless I stuffed my face with something super rich & chocolate-y. But I also wanted to try something new. Regular ol’ GF chocolate cake or brownies just didn’t seem good enough. *Use organic ingredients whenever possible for a yummier, better-for-you version of this recipe. Preheat oven to 350°. In a large bowl with an electric mixer, cream the cream cheese and butter until smooth. Beat in the egg. Then beat in the GF vanilla extract. Beat in the GF cake mix. Cover and refrigerate for 2 hours to firm up so you can roll the batter into balls. Roll the chilled batter into tablespoon-size balls and then roll them in confectioner’s sugar. Place on an ungreased cookie sheet, 2 inches apart. Bake 12 minutes. The cookies will remain soft and gooey. 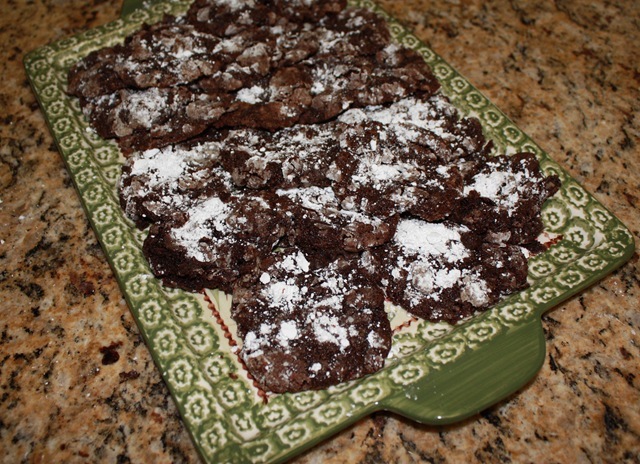 Cool completely and sprinkle with more confectioners’ sugar, if desired. Then keep cookies in the fridge until ready to serve! Tip: I served this amazing little treats with Mighty Leaf’s Vanilla Bean hot tea… incredible!! !